When it comes to food in this city, I hear about a lot of things and think, “I have to have that.” Blue cheese gelato was absolutely one of those. I mean, really, how could you not? I’ll admit I wasn’t completely sold on the idea since blue cheese is far from being one of my favorites cheeses, but curiosity was enough to get me over to Park Slope to try it anyway. And you know what? L’Albero dei Gelati’s blue cheese gelato, made from ash-veined Vermont goat cheese, when paired with a rich, creamy chocolate was not only one of the most surprising ice cream combos I’ve eaten but also one of the best. The pale grey gelato was unmistakably cheesy, with the creamy tang of blue cheese bright in each bite. It might’ve been too much on its own, but the chocolate subtly toned down the savory aspect and added a sweetness that made for a perfect balance in flavors. I had to have it when I first heard about it and now that I have, I’m thinking yup, I have to have that again. 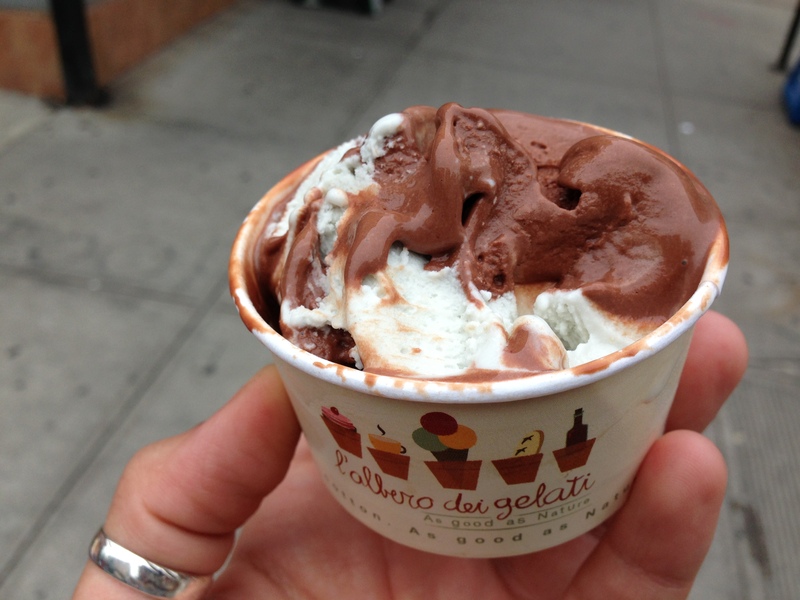 This entry was posted in Sweet stuff and tagged blue cheese, brooklyn, chocolate, gelato, ice cream, L'Albero dei Gelati, Park Slope. Bookmark the permalink. ← Healthy choice for the win!